Huge Savings Item! Save 15% on the 5/16-Inch Keystone Tip Screwdriver, 6-Inch Heavy Duty Round Shank with Cushion Grip Handle Klein Tools 602-6 by Klein Tools at Donations Central. SKU: 318418. MPN: 602-6. Hurry! Limited time offer. Offer valid only while supplies last. With a 6 in. shaft, the Klein Tools 5/16 in. 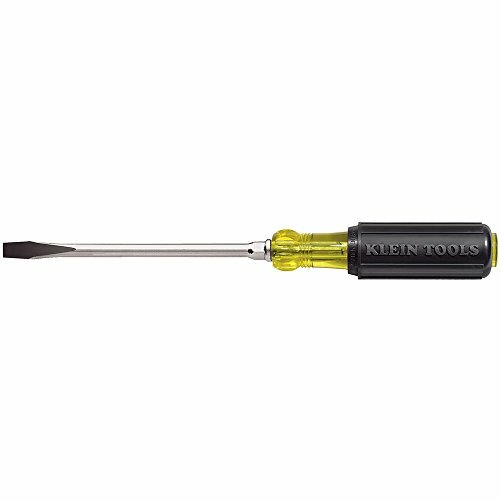 Keystone-Tip Screwdriver features quality tempered steel, carefully heat-treated for ideal durability. With a 6 in. shaft, the Klein Tools 5/16 in. Keystone-Tip Screwdriver features quality tempered steel, carefully heat-treated for ideal durability. An insulated, cushion-grip handle and integral flanges on the inside provide a solid, twist-resistant blade anchor that allows for optimal torque and comfort while offering protection against electric shock.